Justin and I had both been to Boston before, but we had never been with each other. Plus, neither of us had a particularly good experience when we visited in the past. Justin had been there on a business trip and didn’t get to see much of the city. And when my mom and I were in Boston before, a homeless man harassed my mom (and licked her hand…yuck!). Since Justin and I were in Massachusetts, we wanted to change our memories of Boston and create a new memory of it together. 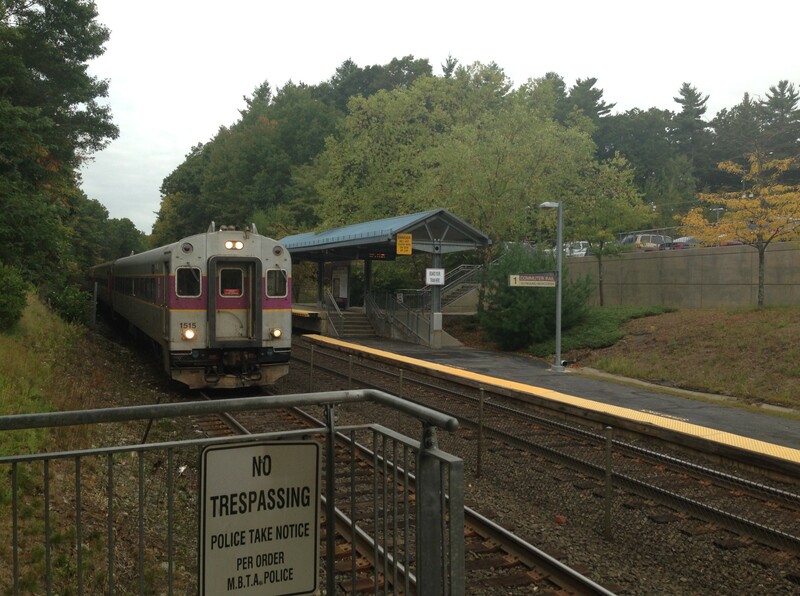 We didn’t want to drive in Boston though, so we took a commuter train into the city. However, we still had to drive 23 miles to the train station, which took 1.25 hours. There were so many school buses, we had to dodge them left and right! We thought we were going to miss the train! Luckily we made it to the train station with about 5 minutes to spare, just enough time to take a few deep breaths before boarding the train. The train ride itself lasted about an hour and was uneventful. Actually, it was amazing to sit back and relax while being transported to our next destination (especially after how stressful it was to get to the train in the first place). Once we reached Boston, we started off by walking to Copley Square. I absolutely adore old churches, and it seemed like there was one on every corner, each with its own uniquely detailed architecture. 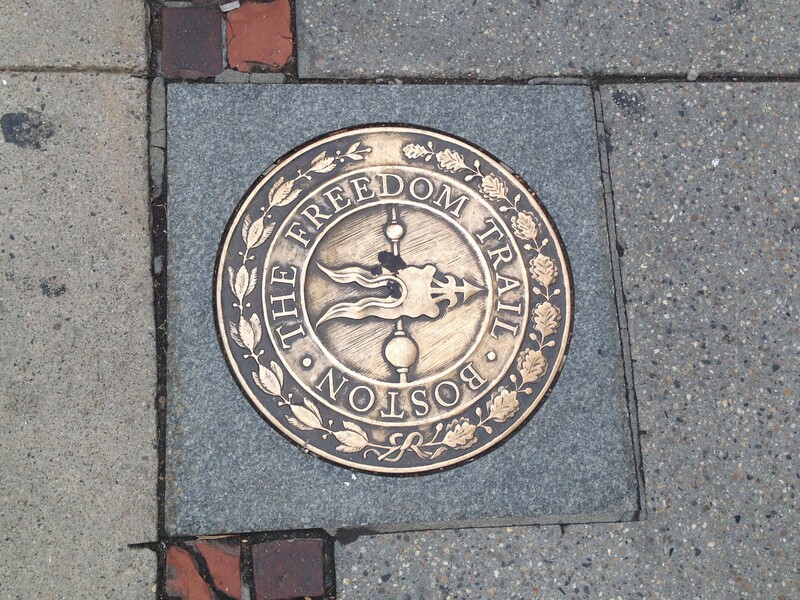 While in the historic city of Boston, we wanted to do the Freedom Trail. The self-guided walking tour begins in Boston Common, the oldest city park in the country which dates back to 1634. As we headed to the starting point of the trail, we stumbled upon the Public Garden. We hadn’t intended on visiting the nation’s first public botanical garden, but since it was directly across the street from the Common, we decided to take a shortcut through it. The garden was simply lovely with a large pond in the center and a nice mix of flowers and greenery. We strolled across a bridge as we watched ducks and swans gliding through the Lagoon below. Willow trees added to the romantic scene with their long, wispy branches reaching for the water. If you only have time to visit one park – either the Common or the Garden – definitely go to the Public Garden! I was completely surprised by how much I liked the Garden. I assumed it would be similar to Boston Common, which I was not a fan of. I had visited the public park when I was in Boston with my mom before and quite frankly was disappointed and underwhelmed with it. I had anticipated a smaller Central Park, but it turned out to be just like any other basic grassy space. I was not looking forward to returning to the Common (that’s where the creepy bum licked my mom’s hand…so disturbing!). Luckily, the Public Garden helped me forget how much I disliked it’s neighbor, Boston Common. Before starting the trail, we took a quick detour over to the iconic Cheers bar. The TV show was before my time, but Justin was a big fan of Cheers while he was growing up. He was excited to see the famous bar exterior featured on the show. After perusing the Cheers gift shop, we trekked over to the Visitor Information center in Boston Common. This is where the historic Freedom Walking Trail begins. From there, we started on the trail by following the guiding line of bricks in the sidewalk. A short walk across the park brought us to the Massachusetts State House, a large colonial style building with an impressive gold dome. Completed in 1798, it’s one of the oldest buildings on Beacon Hill. Our next stop was the Park Street Church. On the ground in front of the church, we noticed a gold emblem with the words “The Freedom Trail – Boston.” In this case, “X” didn’t mark the spot, the gold emblem did. We were at the right place! Yay! Between the bricks and the emblems, we now knew what to look for when searching for sites along the trail. Following the red brick line and finding the Freedom Trail markers at the historic sites became a fun game, almost like a scavenger hunt. 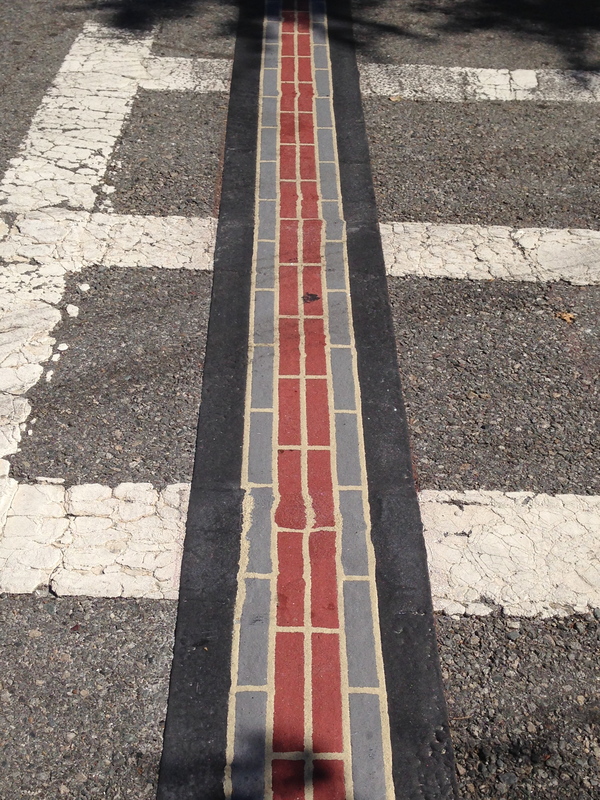 Follow the red brick line, follow the red brick line (sorry, I couldn’t resist the “Wizard of Oz” reference…haha!). As we continued walking, we reached the Granary Burying Ground, the third oldest burial ground in Boston. With tombstones from the 1700’s, the cemetery contains the burial sites of Paul Revere, John Hancock, Samuel Adams, Benjamin Franklin’s parents and the victims of the Boston Massacre. The gravestones were physical proof that these prominent historic figures actually existed. Studying about them in school always made them seem like fictional characters to me. But they were real people who lived hundreds of years ago and were so vital in our nation’s history, that they are still being celebrated several centuries later. They definitely made their mark. It was humbling and somewhat mind-blowing to see the final resting places of these famous people. Our next stops included King’s Chapel and Burying Ground. The original King’s Chapel was a small wooden structure. Eventually, the building became too small for the growing congregation and had to be rebuilt. But rather than knocking down the original chapel to make way for the new building, the larger granite structure was built around it. The wooden chapel was then disassembled and removed through the windows of the new chapel. It was later rebuilt in Nova Scotia. Yes, Nova Scotia. Random, right?! I never used to be too interested in history before, but I was fascinated by the stories of the different sites along the Freedom Trail! Another two-in-one stop on the trail happened to be right beside King’s Chapel. How convenient! First we saw the site of the original Boston Latin School, which was commemorated with a mosaic in the sidewalk. The original school building was torn down in 1745 for the expansion of King’s Chapel. Even though the initial school location no longer remains, the school has continued in different sites and still exists in Boston today. The Boston Latin School was founded in 1635, making it the oldest public school in the United States. I love this quote by Benjamin Franklin! The next trail site was the Old Corner Bookstore. We were expecting to see an actual bookstore but were shocked (and somewhat saddened) to see that the Old Corner Bookstore, the oldest commercial building in Boston, is now a Chipotle! At least they kept the original restored brick building instead of demolishing it to construct a new Chipotle building, I guess. This merging of history and modern day was definitely an interesting sight to see. From the Chipotle, er… I mean Old Corner Bookstore, we stopped by the Old South Meeting House (right by a 7-Eleven!). Once the largest building in Boston, this is where the colonists met to decide what to do about the tea from England, which led to the significant Boston Tea Party. A short walk brought us to the Old State House. Built in 1713, it now sits among towering modern buildings. We suddenly realize how much we love Boston with its juxtaposing historic buildings and modern architecture. I am so grateful that these centuries-old structures have been preserved despite a major metropolitan city growing up around them. Right outside of the Old State House is the site of the Boston Massacre marked by an arrangement of bricks in the ground. We had seen the grave marker for the victims of the massacre while we were at the Granary Burying Ground. Seeing the site where those people had actually been killed was quite sobering. Next on our list of places to visit was Faneuil Hall. With a market downstairs and the Great Hall upstairs, Faneuil Hall has served as an open forum meeting hall and marketplace for more than 270 years. While walking through the market area, we came across the National Park Service and saw that they offer free Freedom Trail tours. 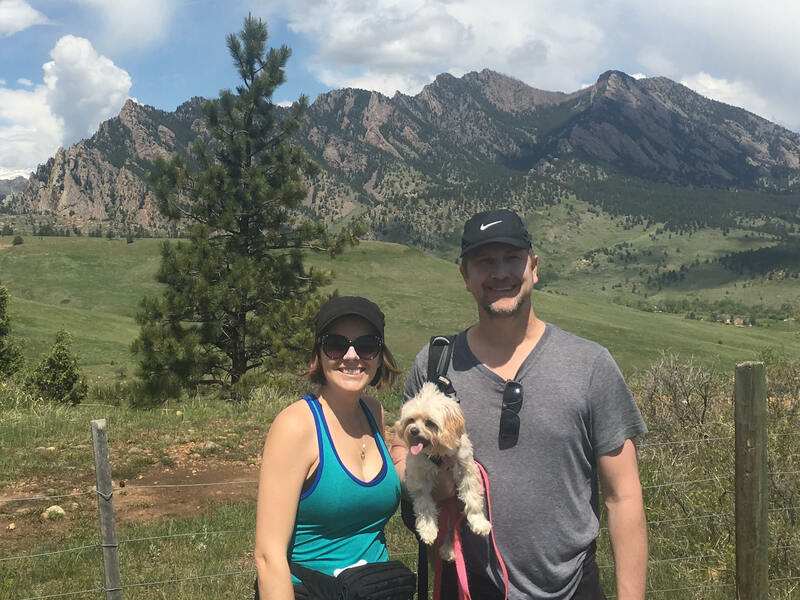 It would have been nice to have known that before we set off on our own, but we still learned an immense amount of interesting information on our self-guided tour. Lastly we headed to North End, known as Boston’s Little Italy, to see the Paul Revere House. This was the longest distance we walked between sites along the Freedom Trail. After all of the walking we had done throughout the day, exhaustion finally hit us here. We made it to Paul Revere’s House and then grabbed a late lunch at one of the Italian cafés down the street. We loved the look and feel of Little Italy but weren’t impressed by the menus of the Italian restaurants (or the food at the one we dined at). Luckily the charm more than made up for the food. Even though there were four more sites left to see on the trail, we decided to call it a day after we finished eating. We still had to walk to the train station, catch a train back to our truck and then still drive the remaining 23 miles to our campground. It had already been a long day, and we still had to make it home. We were bummed that we didn’t finish the Freedom Walking Trail but so happy we saw as much as we did. Overall, we absolutely adored Boston and truly enjoyed the history-filled city! Sounds like you guys had a great time! Love Boston….but way too cold! Boston is definitely one of our favorite big cities! We would have considered living there if the winters weren’t so brutal.